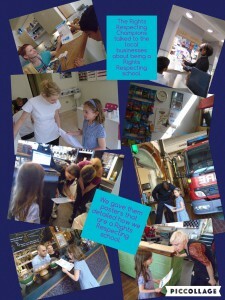 Rights Respecting Schools is an initiative based around the UN Convention of the Rights of the Child. Together with our work on Christian values, it helps us to form a moral code within the school. It encourages children to develop a very clear understanding of their rights but also of the kinds of actions they need to be taking within the school and the local and global community if they want to fully enjoy their rights and ensure that others enjoy them too. This work allows the children to have a much stronger voice within the school which helps us to drive the school forwards. We achieved the Level 2 Rights Respecting School Award in November 2016! Click here to read our Assessment Report for Level 2. During the Autumn Term 2014 our children worked with Artists from ‘Love Art For Schools’ to create bespoke pieces of art work that represented some of the UNICEF Articles. EVERY child from Nursery to Year 6 participated and their individual art formed the main pieces which are now beautifully displayed in our school hall! 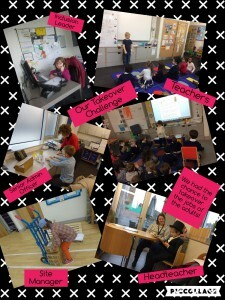 Click here to see our fantastic art work! 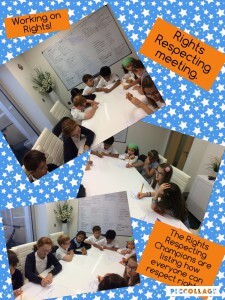 Click here to read the powerpoint our Rights Respecting Champions created.